A popular cooking spice, turmeric also has a long history of use as a medicine. It contains a substance called curcumin, which appears to account for its therapeutic effects. The University of Maryland Medical Center reports that research has shown it might help treat a variety of conditions, ranging from cancer to digestive distress, but not all studies have found positive results. The optimal dose of turmeric will depend on your reason for using it. A doctor well-versed in alternative medicine can offer guidance on an appropriate dose and other aspects of safe use. Supplemental turmeric comes in many forms. The Beth Israel Deaconess Medical Center notes turmeric supplements standardized to contain a certain amount of curcumin – typically 90 to 95 percent -- are the most common for medicinal purposes. It notes a standard dose usually falls between 400 mg to 600 mg three times a day, though some conditions might require larger doses. The University of Maryland Medical Center notes the following typically recommended daily doses for other forms of turmeric: cut root: 1.5 to 3 g; dried, powdered root: 1 g to 3 g; fluid extract: 30 to 90 drops; tincture: 15 to 30 drops four times a day. The following daily doses of standardized turmeric supplements were used in scientific studies, according to MedlinePlus and the University of Michigan Health System: dyspepsia: 500 mg four times a day; rheumatoid arthritis: 400 mg three times a day; Crohn’s disease: 360 mg three times a day; low back pain: 400 mg to 600 mg three times a day; HIV/AIDS: 1 g three times a day; ulcerative colitis: 550 mg three times a day. MedlinePlus advises you against using turmeric supplements if you suffer from gallbladder disease or obstruction of the bile ducts. Its potential to stimulate menstrual bleeding and uterine contractions could prove dangerous during pregnancy. Beth Israel Deaconess Medical Center reports long-term use of turmeric might harm the liver and advises you to avoid this supplement if you have liver disease or take medications that increase the risk of liver damage. If you have diabetes, monitor your blood sugar carefully while using turmeric supplements. It might lower blood sugar levels. To avoid hypoglycemia, you might require dosage reductions in insulin or other medications to compensate for the effects. 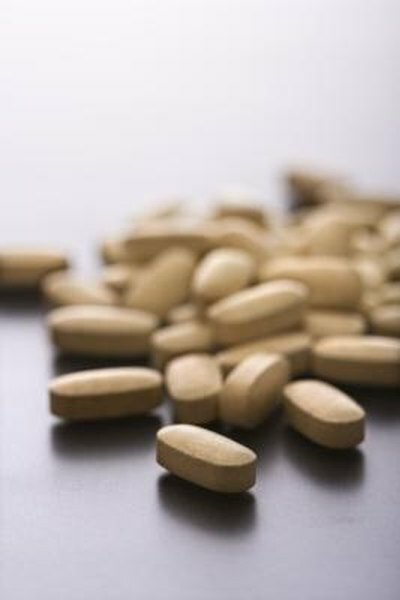 If you have impaired kidney function, it is particularly important to consult with your doctor about using natural supplements and the appropriate doses. Turmeric has demonstrated anticoagulant properties. It could increase the risk of bleeding if you take warfarin or other blood-thinning drugs. Do not combine turmeric with these medications without medical supervision. Stop taking this supplement at least 14 days before a planned surgical procedure. Using turmeric along with medications that reduce stomach acid might reduce their effectiveness.